Phone verification is an important, high-confidence step in a registration flow to verify that a user has the device they claim to have. Adding phone verification to your application will greatly reduce your number of fraudulent registrations and protect future application users from having their numbers registered by scammers. This quickstart guides you through creating a Node.js, AngularJS, and MongoDB app that requires a phone verification step to create an account. Two channels of phone verification are demoed: SMS and voice. Ready to add phone verification to a demo app and keep the bad actors away? Enter stage left! Either sign up for a free Twilio trial, or sign into an existing Twilio account. Click the eyeball icon to reveal your Production API Key, and copy it somewhere safe. You will use the API Key during the application setup step below. While Twilio's Verify API doesn't return any user information you'll need to store, to continue working on the app after this Quickstart you'll want a database. For this demo, we built our user database on top of MongoDB. Instructions for installing MongoDB vary depending on platform. Please follow the appropriate link for instructions on how to install MongoDB for your platform. Enter the API Key from the Account Security console and optionally change the port. And then... actually, that's all the setup you'll need. Assuming your API Key is correctly entered and MongoDB is running, you'll soon get a message that the app is up! Enter a Country Code and Phone Number, then choose which channel to request verification over, 'SMS' or 'CALL' (Voice). Finally, hit the blue 'Request Verification' button and wait. You won't be waiting long - you'll either receive a phone call or an SMS with the verification token. If you requested a phone call, as an additional security feature you may need to interact to proceed (by entering a number on the phone keypad). This function allows you to send the verification code over SMS or Voice depending on the 'via' variable. This function verifies the token for a user delivered over the Voice or SMS channel. And with that, your demo app is protected with Twilio Verify! You can now log out to try the other channel. Your demo app is now keeping hordes of fraudulent users from registering with your business and polluting the database. Next, you should check out all of the variables and options available to you in the Verify API Reference. 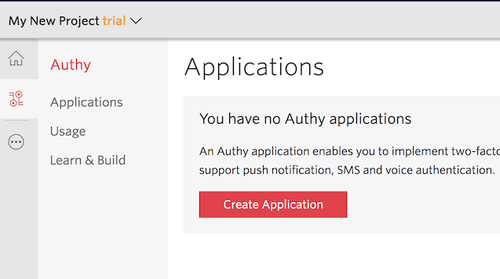 Also, for protecting your customers in an ongoing manner (with this same codebase) try the Node.js Authy Two-Factor Authentication Quickstart. After that, take a stroll through the Docs for more Account Security demos and tutorials - as well as sample web applications using all of Twilio's products. Encore!